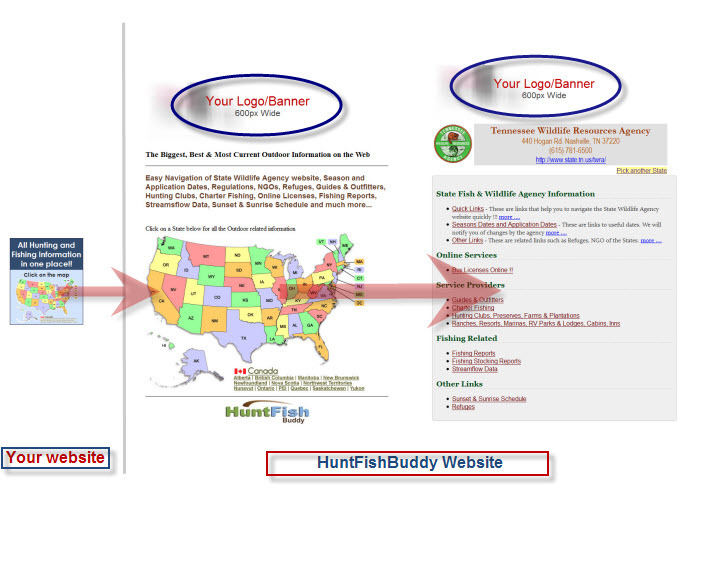 HuntFishBuddy offers its partners The Map Interface and States/Provinces listing as their branded webpage with the partner’s logo or header. Click here to see how it works. Adding the “click on” map to your site is very easy. You provide your company's logo and other details, in the form below. We will provide you with all the code and instructions. Partners can choose to add the listings with or without the listing of other Service Providers (guides, lodges, charter) and also recognized as HFB Partner on the Service Providers listing. Have access to the Most Comprehensive and current Hunting and Fishing information. Do not have to “leave” your website. The links are opened in a separate browser. HuntFishBuddy will feature your website and services on our site as a partner and also provide top billing for your website on service provider listings. Check it out! Your web site visitors will have access to thousands of informational links on your site without no contractual agreement and at no cost! Yes, It's FREE!! If you do not want to include other service providers on your partnership page, please indicate so.